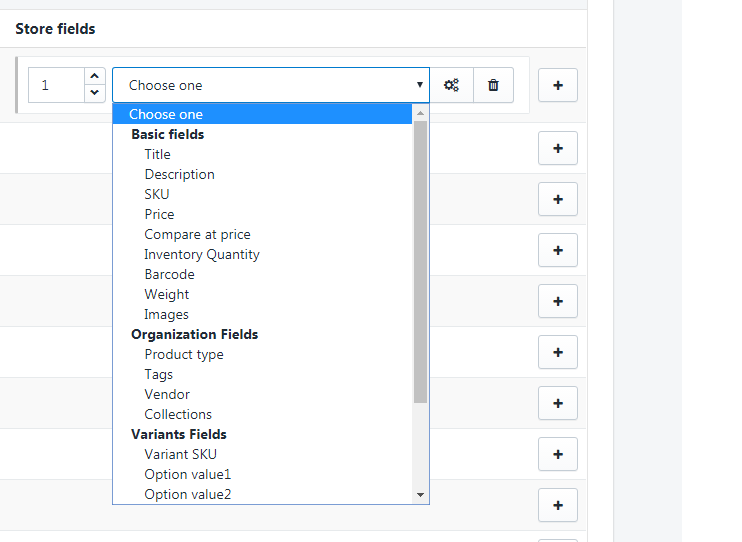 The second step of the Product import wizard is the "Field Mapping". This page comprises of 4 parts: the Field mapping itself, Basic mapping settings, Update options and a Check list. We will write about each section in separate articles. First, let's see the overview of the Field Mapping itself. Under the "ID" you can see a chain icon, which is one of the most important parts of our field mapping system. Syncee masterfully treats variants of your products, but in order to do that, it is required to mark one Feed Heading, that we can use to identify variants. Wholesalers usually refer to this as "product ID, group ID or product reference". For instance, if you have a "T-shirt" but you have it in five colors, you need to mark the field that contains the "T-shirt" with the chain icon, so Syncee will be able to recognize that it is the same T-shirt but in different colors. Under the "Feed heading" you can see the name of each column, that is the first row of your source file. For example, SKU, Size, Wholesale Price or Image. Here, the sample shows the value of the second row, each belonging to the heading above them in the file. Using the small arrows, you can navigate among the first 30 rows of your data feed file, and check if Syncee has successfully identified the values with the headers. If the data here is not correct, please go back to the previous step, "Add File" and check your source file settings. If you have difficulties adding your file, please contact our support staff. Then, under the "Store fields" you can start mapping the fields of Shopify's "Add product" page to your product source feed file's fields. They have the same name, so you don't have to worry about not recognizing them. In the second section, you can find the "Basic mapping settings", like inventory tracking, weight and tax settings, but if you want to learn more about them, click here. The third section allows you to set your "Update options", that is crucial when you want to update the products already existing in your store. To learn more about these settings, click here. Finally, the last section of this page is the "Check list", that tells you if something is wrong with the mapping or if you missed out something. If you need assistance with the Field Mapping, let us know.